Dan Barry, renowned New York Times columnist and two-time Pulitzer Prize nominee, saw something in the longest game in the history of professional baseball: that it was about much more than baseball. It was an April 1981 Triple A minor league game between the Rochester Red Wings and the Pawtucket Red Sox. With a tied score of 2-2, the game continued until 4:00 a.m. on a cold Easter Sunday. A misprint in the 1981 Minor League Handbook had excluded the guidelines for games that went into excessive overtime, so the teams played on until the Red Sox managers finally contacted the league president, who advised them to pause the game. It resumed in July and finally ended after 33 grueling innings. Barry does much more than relay the facts of the record-setting game, he gets to the heart of it. 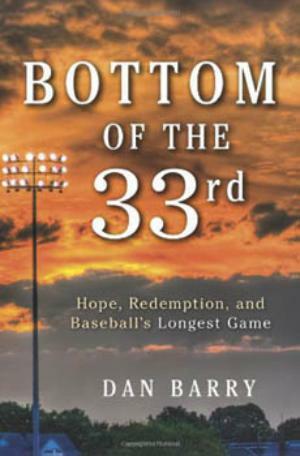 From the first page, when his narrative slowly zooms in on the quiet town of Pawtucket, Rhode Island and settles on the decrepit, depression-era McCoy Stadium, Barry begins to build a stunning panorama of a baseball game, a moment in history, and all the lives involved.